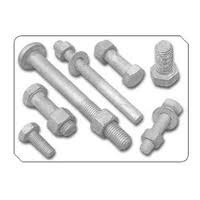 Capitalizing on our industrial experience of 40 years, we fabricate extensive range of automotive fasteners, machine components including Nuts, Bolts, Studs, ASTM nuts, ASTM studs, 2H NUTS, B 7 STUDS, HEAVY HEX NUTS, Threaded Bars, Studs & Threaded Bars & Forgings. Our organization is committed to offer our range to automobile sector , construction sector, petro chemical sector , offshore and allied industries. Our advanced technology helps us to fabricate our range as per client specifications and details. We also offer Nuts (Hex Heavy (2H) Nuts, Flange Nuts, Assembly Nuts, forged components. We are the proud member of FMAI and also have been affiliated with Engineering Export Promotion Council. Owing to our dedicated approach of our team has made us to supply our range in the markets across North America, Europe & Middle East.